Hear ye! Hear ye! All loyal subjects of the Kingdom of Cagliari are summoned to his Royal Highness, King Allegri of Milan’s, Royal Celebration of the Conquering of the Scudetto! Okay, maybe that’s not the invite that went out, but it turns out that Allegri will be welcoming his former club to his new kingdom with a Scudetto in his pocket. That man really knows how to do things. Oh, and there will be some serious partying, too. Poor Cagliari are coming off of 2 draws and 3 straight losses. Now they have to come to the San Siro to watch a stadium full of fans cheering on their newly crowned champions? If it weren’t for the blue on their uniforms, they could be the red carpet for AC Milan. But that is not how Cagliari rolls. They did not earn 44 points and an 11th spot in the table by rolling over for their opponents. In fact, it took a Strasser goal 5 minutes from time back in January to allow Milan to take full points from this club. 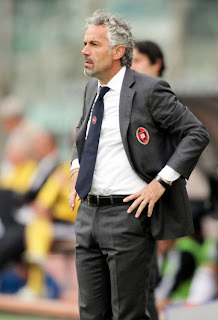 And even if they still had the fabulous striker Alessandro Matri, I’m sure Coach Donadoni would love to make a good impression at the club he played for back in the day. The key to Cagliari’s success could easily lie with a midfielder named Andrea Cossu. Cossu, you ask? He’s only got 3 goals on the season. How does that help them? Well, since you asked, I will tell you: He is the leader in assists in all of Serie A. 13 assists, to be exact. Shut him down and you have all but stopped their scoring chances. Leave him unmarked, and he’ll find someone to feed, I’m sure. We should also be concerned about strikers Robert Aquafresca and Nene, with 8 and 6 goals respectively. Captain Daniele Conti, son of former Italy and Roma star Bruno Conti, along with Lazzari, Biondini (the redhead whose name means little blonde! ), Nainggolan and Missiroli are their star midfielders, with plenty of goals and/or assists to show for their season. Those charged with preventing Milan’s victory lap would be some combination of Ariaudo, Canini, Astori, Agostini, and Perico as well as keeper Agazzi, who has done quite well this season. It should be noted that former starting keeper Federico Marchetti has been frozen out all year at Cagliari, and is rumored to be coming to Milan next year. I gave up long ago on guessing Allegri’s lineups, I am simply not in tune with his thinking at all. Least of all for this match. With nothing to lose, he could put the trainers and massage therapists out there, but something tells me he won’t. To be able to put out all of the repeat Milan Scudetto winners would be something truly amazing for the fans, but he has never been mushy or sentimental, so don’t count on it. He could put out some or all Primavera players, who knows? Let’s face it, he’s King Allegri, and this is his court, he could put out anyone he wants. Inzaghi: Will he or won't he? What I am most looking forward to are the Scudetto celebrations. Allegri and all of our boys have stuck with it through thick and thin this year and they have now earned the ultimate reward for their labors. As a fan, nothing brings me greater joy than to watch them celebrate and interact with the fans who are fortunate enough to be there, even if it will be in those new jerseys. But in all honesty, I think a convincing win would go a long ways to remind them of the glory they deserve, even if we were knocked out of Coppa contention on Tuesday. 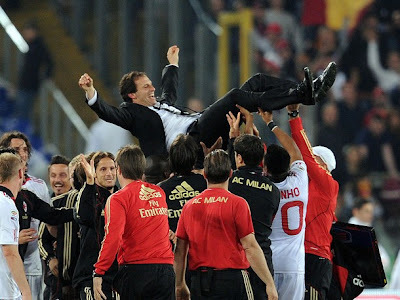 So I am hoping that Allegri fields a team that represents Milan, whether it be young or old, new or wise, a team that can keep Cagliari in check and kindly remind them that Milan are the Champions of Serie A 2010-2011. And a match fit for a King. This post was brought to you by the Italian musical inspiration of the great Andrea Bocelli. NOTE: Due to technical difficulties beyond our control, the original post disappeared into cyberspace. We apologize for the inconvenience, and especially to those of you whose comments may have been lost.